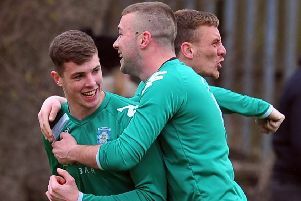 LEADERS Farsley Celtic Juniors turned their attentions to the Terry Marflitt Trophy with a 4-1 win against second-placed Championship side Wortley putting them in the next round. After a goalless first half, Farsley opened the scoring through Joe Firth but Wortley struck back immediately from the penalty spot. The second goal for Farsley was grabbed by Craig Farrand and then Tom Ormanroyd sealed the victory with a brace. Championship newcomers Garforth Crusaders succumbed to Premier Division side Athletico. Muhammed Qasim scored the only goal of the game from the penalty spot after being brought down in the box. An all-Premier Division affair between third-placed Grangefield and sixth-placed Horsforth St Margaret’s ended in a 3-0 victory for Grangefield. Grangefield dominated the game with the ball and pressed fiercely without it. All the goals came in the second half when Chris Barr opened the scoring with a penalty. Kristian Dacre scored twice after coming off the bench with two sublime finishes. Yorkshire Amateur League Champions Drighlington met last season’s Leeds and District Cup finalists and Division One champions Leeds City Old Boys with Drighlington coming out on top, winning the contest 3-0 away from home. It was not until the 65th minute that Drighlington broke the deadlock but Ben Small, Josh Frankland and Sam Thorpe earned Drig the ticket to the quarter-finals. The clash between the bottom club in the Premier Division, Wibsey, and the 10th team in the Championship, Leeds Independent, was marred in a way by circumstances dictating that Wibsey had only ten players. Leeds Independent eventually won the game 2-1 but there were chances galore in the first half and Wibsey hit the woodwork four times and even had the ball in the net but it was disallowed. Marlon Richards put Independent 1-0 up shortly followed by substitute Daniel Walker who made the score 2-0. Wibsey kept fighting though and pulled one back through Jamie Brennan but they couldn’t find the equaliser. Leeds Medics & Dentists were expected to beat Collingham Juniors who sat bottom of Division One and did so comfortably, 6-1 after being ahead 4-0 at the interval. The goals were shared between Sammy Bzeu, Colm Hicks, Brad Chambers, Francisco Matos, Hugh Goodfield and Alex Grigg. In the Premier Division Stanley United took their win tally to three as they overcame Ealandians in a thrilling 5-3 contest. Away side Stanley were always in front throughout the encounter and performed exceptionally to secure all three points. The goalscorers on the day for Stanley were Josh Whiteley, who bagged two, Rhys Bruce, who also grabbed two, and Joe Childs. Ealandians’ goalscorers were Damon Nicholls, Conner Judson and Adam Whittaker. This 5-3 goal-fest sends Ealandians down to tenth on seven points and Stanley moved up to fifth on nine points. The only other game in the Premier Division owing to cup commitments was between Calverley United and Stanningley. Home side Calverley started the better team but Stanningley grew into the game gradually but it was the home side that broke the deadlock via Ben Cook. Calverley doubled their lead in the second half through Dale Spink and saw the game out comfortably to secure all three points. Stanningley were reduced to ten men with 15 minutes to go which hampered their slim comeback chance. The defeat leaves Stanningley 11th and in the relegation zone on six points. Calverley moved up to ninth on seven points. There were two games played in the Championship with Leeds Medics & Dentists Reserves moving out of the relegation zone and up to eighth with a 2-1 win at bottom club Beeston St Anthony’s, who remain without a point. St Bedes sit sixth after overcoming fourth-placed visitors Shire Academics 4-3, inspired by a Jermaine Moyce hat-trick. After Moyce’s treble, Miles Smith headed the winner with goals from Ben Freeman, Sam Lyons and Jordan Talbot in vain for Shire who had held a 3-1 lead. THE YORKSHIRE Amateur League’s Ealandians Reserves held their nerve to progress to the third round of the West Riding County FA Challenge Cup with a 4-2 verdict on spot kicks at Halton Moor following a 2-2 draw, writes LEE SOBOT. Ealandians sit fifth in the Yorkshire Amateur League Championship and faced a thriving side in Wakefield League Premier Division outfit Halton Moor who still have a 100 per cent league record with four wins out of four. Moor took the lead in the tie and while the Wakefield League outfit then saw a player sent off, the lead was doubled after the break. But Ealandians eventually made their numerical advantage count as goals from Jonny Pickles and Ant McDonald took the match to penalties. Ealandians then scored every one of their penalties with Halton missing two as goalkeeper Danny Tuck saved one of them. The reward for Ealandians is a home tie with Tingley Athletic in the third round. In the West Riding County FA Challenge Cup, West Yorkshire League Premier Division outfit Wyke Wanderers saw their bid for glory ended with a 4-3 loss at home to Sowerby Bridge. In the West Riding FA County Sunday Trophy, Amaranth Crossgates Athletic booked their place in the third round with a 2-0 win at Crown & Anchor. Amaranth’s Joe Packer and Charlie Storie bagged a goal each. In the FA Sunday Cup, Leeds City Rovers marched on into the third round with a 4-1 win at home to Liverpool County Premier Division side BRNESC, formerly British Rail. Rovers will face a home tie with Sunderland Southwick in the third round which is the last 32 on Sunday, December 9. But Leeds Combination Hope Inn Whites saw their FA Sunday Cup adventure ended through a 4-2 loss at Allerton.